The HALO SnoozyPod vibrating bedtime soother is the first device to combine gentle vibration, soothing sounds, and an amber glow nightlight to help reduce the bedtime battle with your child. Designed to fit most twin beds, toddler beds, and cribs, SnoozyPod's calming vibration, comforting sounds and soft amber glow nightlight create a peaceful bedtime routine that your child will look forward to. There are two levels of soothing vibration to calm your little one to sleep. Your child will look forward to the soothing vibration, which can be set to play for 30 minutes or all-night long. On the 30-minute setting, vibration fades gently after the 30-minute timer expires, so that children don't startle awake when vibration stops. There are four soothing sounds: heartbeat, white noise, soothing stream, and rainforest. Soothing sounds can be set to play for 30 minutes or all night long as a helpful sleep cue in your little one's bedtime routine and to help quiet household noises that may disrupt sleep. The nightlight uses a soft amber LED bulb because the latest research on sleep environments shows that amber light does not interrupt our body's circadian rhythm. The nightlight has two levels of brightness and runs for 30 minutes. In addition, SnoozyPod is Bluetooth enabled, so caretakers can operate the device from the app, without entering the child's room. Within the SnoozyPod app, parents can choose to lock the button functions so little hands cannot change the settings of SnoozyPod. An AC adaptor allows for continuous use, with a backup battery option convenient for traveling or power outages. SnoozyPod fits snuggly under the mattress leaving a flat surface for your child to comfortably sleep. And most important, when your little one is happy and comfortable in his bed, he's most likely to stay in the safest place for him, his own bed. 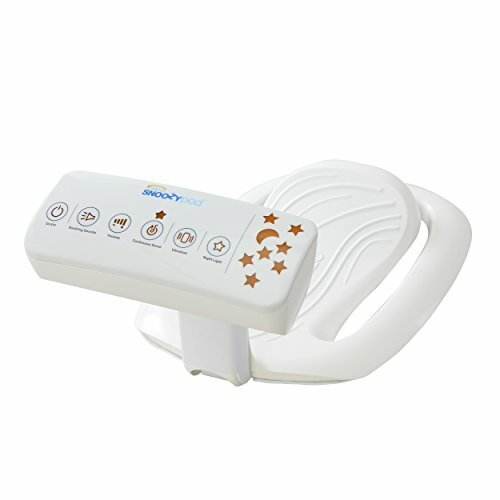 Reduce the bedtime battle with 2 levels of gentle vibration that will soothe your child in his own bed. Vibration can be set to play for 30 minutes or all-night long. On the 30-minute setting, vibration fades gently after 30-minute timer expires, so that children don't startle awake when vibration stops. Create a peaceful bedtime routine that your child will look forward to with 4 comforting sounds: heartbeat, white noise, soothing stream, and rainforest. Soothing sounds can be set to play for 30 minutes or all night long to block out household and environmental noises that can disrupt sleep. Soft amber glow nightlight offers just enough light to see without causing wakefulness. The nightlight has two brightness settings and runs for 30 minutes. Bluetooth enabled for Apple and Android so you can operate the device from the app without entering your child's room. Parental lock function can be set from the app so that children cannot adjust SnoozyPod settings from bed. SnoozyPod fits snuggly under the mattress leaving a flat surface for your child to comfortably sleep. Designed for twin beds, toddler beds and cribs.